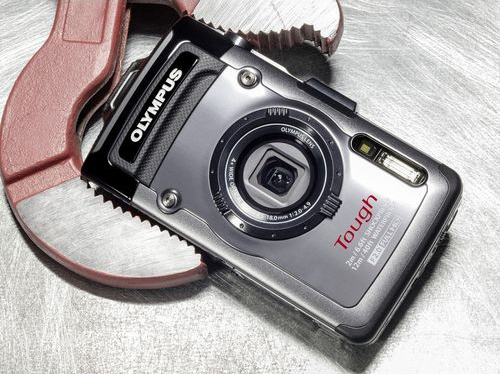 Оlympus now have a brand new Tough camera which is water and cold resistant, and also crush proofed. lympus now have a brand new Tough camera which is water and cold resistant, and also crush proofed. This is TG1. We usually start with the design, but first we’d like to mention some of the advantages of having a camera like this. It could go down to 12 meters underwater, function normally at a temperature of -12 C, stand up to 100 kg weight and a survive after a 2 meter fall. That armored thing weights 230 g, and has the following dimensions – 111.5 mm width, 66.5 mm height and a thickness of 29.1 mm at its thickest part. The corpus is made from metal and rubber. With the Olympus TG-1 you can take great pictures underwater even if there’s not enough light. The focus distance is from 4,5 – 18 mm. The focus distance is from 4,5 – 18 mm. If you want to shoot many pictures one after the other – this camera allows you to make 5 shots for one second.And if you are really keen on scuba diving, you can get a special kit for going to 30 meters underwater, but it is not included in the standard packaging. The same goes for the water-resistant ‘fisheye’ convertor lens. The matrix is a 12.7МР CMOS 1/2,3 ” with a RGB color filter. It has a 4x optical zoom, which could get up to 16x, combined with the digital zoom. The matrix is a 12.7МР CMOS 1/2,3 ” with a RGB color filter. And since this camera is made to be used a lot underwater, we shoud focus on the focus. It’s a TTL iESP autofocus with contrast detection and the possibility of tracing objects and faces manually or automatically. For wide-angled shots the minimum is 15 sm and the maximum up to 5 meters and 60 sm. At telemacro the numbers go down to 1 sm and up to 2 meters and 20 sm. If you’re using the Olympus TG-1 for shooting video, it could be up to 29 minutes long and with 1080P resolution. The built-in memory of the camera is 7,9 MB, but a MicroSD card slot of course is available.